Thirty Nigerian students of Chang'an University visited high-speed railway training base in northwest China's Shaanxi Province. [Photo Credit: NEWS.CN]. At least 30 Nigerian students in a university in China are understudying the rail system of the Asian nation. What you know about Nigeria's drive to revive its rail system may be shallow. But the truth is that the nation could achieve its plan if only it is willing enough to do so and pursue this desire with vigour. When you are done with this story, you are likely to say: "I wish that these young chaps in these photographs will be put to use in the nation's drive to transform its rail system". That is our wish too. 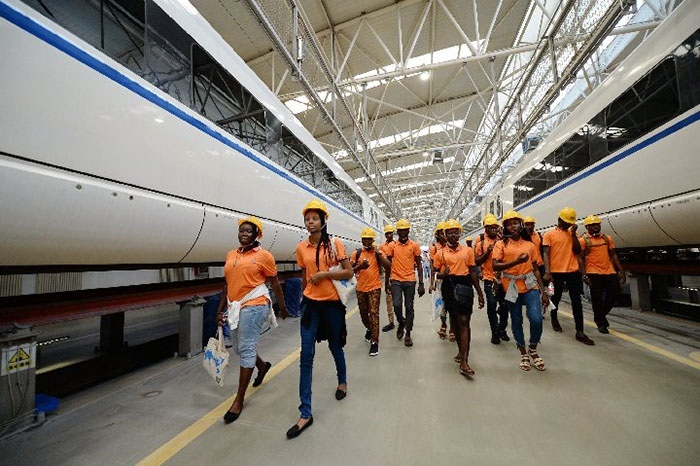 Some 30 Nigerians are studying in Chang'an University in Xi'an, China and they are giving attention to how the China rail system which is one of the best in the world works. You know that it is a Chinese company, China Civil Engineering Construction Corporation, that is handling Nigeria's new light rail system in Abuja and other rail revival drive in some other states. One thing you may not know is that they will not remain in Nigeria forever. At some point, some Nigerians will have to take over the whole process and also handle maintenance, improvement plan and everything in between. These young Nigerians studying in Chang'an University may be getting ready to do this task. They visited a train maintenance plant in Xi'an, northwest China's Shaanxi Province and the high-speed railway training base, innovation workshop and train maintenance plant on August 29, 2018. Their visit was captured in pictures and shared by Xinhuanet. See what and what they did. A Nigerian student operates a train simulator in Xi'an, northwest China's Shaanxi Province, Aug. 29, 2018.